BEAVERTON, OREGON, September 13, 2016: Audio Precision, the recognized standard in audio test, today announced its collaboration with LnK to address the SoundWire audio test needs of MIPI Alliance member companies. 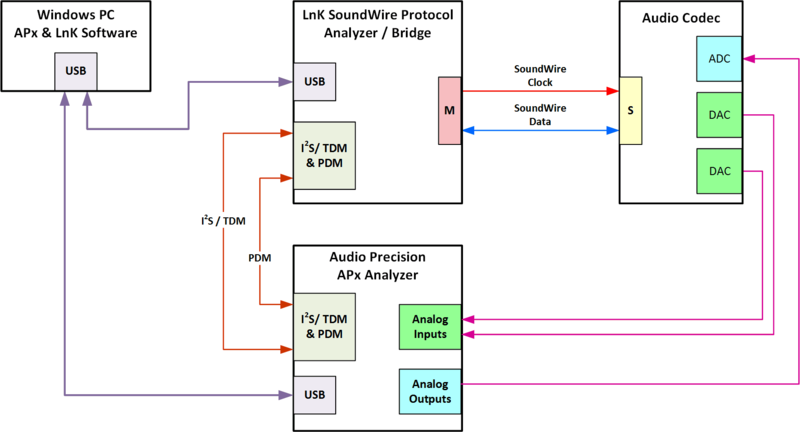 Combining an APx Series audio analyzer with LnK’s protocol analyzer creates a closed-loop measurement system for the real-time evaluation of chipset and mobile product designs incorporating MIPI’s SoundWire interface. Developed to address the limitations—such as power, pin count, ease-of-integration, scalability—of legacy interface designs, MIPI SoundWire reflects the efforts of more than 25 MIPI Alliance members and offers both complementary and unique features as an alternative to MIPI SLIMbus® for the integration of audio devices in mobile, or mobile-inspired, systems. SoundWire can be implemented in small, very cost-sensitive audio peripherals such as amplifiers and microphones and offers features that include double data rate; low complexity, power and latency; PCM and PDM formats; and multichannel data. Block diagram of the SoundWire audio test system created via the pairing of an Audio Precision APx Series audio analyzer and LnK Soundwire protocol analyzer. The pairing of an APx Series audio analyzer and LnK protocol analyzer eliminates the need for device designers to develop their own SoundWire Master IP in order to conduct audio testing. More importantly, it offers additional, real-time test capabilities, including the measurement of propagation delay, acoustic response and other transient behaviors. Audio Precision and LnK will demonstrate SoundWire audio testing at this week’s MIPI Development Conference (booth #8) in Mountain View, California, USA. Founded in 2007, LnK provides protocol analyzers, as well as training and test consulting services, for SLIMbus and SoundWire interface technologies. LnK is an active member of the MIPI Alliance. For more information, visit http://www.lnk-tools.com/. Audio Precision is the recognized standard in audio test. Since 1984, AP has offered high-performance audio analyzer instruments and applications to help engineers worldwide to design and manufacture consumer, professional and industrial audio products. AP is an active member of the MIPI Alliance. For more information, visit http://www.ap.com/. MIPI®, SLIMbus®, SoundWire™, MIPI Alliance and the dotted rainbow arch and all related trademarks, trade names, and other intellectual property are the exclusive property of MIPI Alliance. This entry was posted in News, Press Releases and tagged APx52x Series, APx555, APx58x Series, LnK, MIPI Alliance, SLIMbus, SoundWire by Eric. Bookmark the permalink.